Stylishly transport logs for your fire with this Panacea Leather Log Tote. The durable, leather body, sturdy handles, and tan color of this tote will certainly add a distinguished look to your hearth. Its polyester lined interior reinforces the leather body, while robust, metal fasteners and heavy duty stitching complete the unit. The tote holds several logs at once, and wooden dowels at each end add support and strength to the handles. Use the handles to hang this item next to your fireplace accessories, or fold it flat for convenient storage. 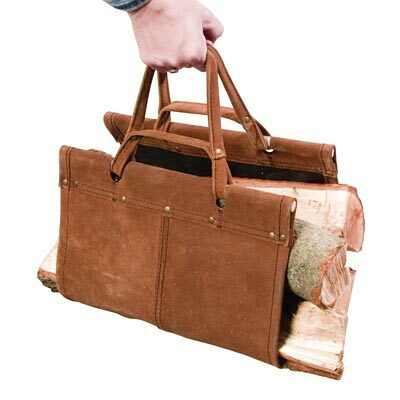 Carry several fire logs with ease using this Leather Log Tote. Note: The color tone of the log tote may vary.